Recently, I bought some raw shrimp at the local market. Because of our crazy busy summer schedule, I needed to prepare the shrimp in a way that was quick and easy. Basil has been growing like mad in my garden so I thought it best to whip up a fast sauté with tomatoes, basil, shrimp and Parmesan cheese. As many of you know, I try to stay away from white flour and high carbs, so this fit the bill for a light Sunday brunch dish. Preheat a large sauté pan over medium-high heat; add olive oil and garlic. Sauté until garlic is lightly browned. Add shrimp and cook quickly until shrimp is pink and cooked through. Remove from pan. In a medium bowl, combine remaining ingredients and toss in the shrimp. Season to taste. Serve as a salad or pour it over lightly toasted crusty bread for a tradition bruschetta appetizer. I have been on a shrimp kick lately (on high carb pasta…hehe) and will have to try your recipe. Summer and fresh and delicious! We also have beautiful basil growing in our garden. Oh yes, Shanna… The basil and tomato combination tastes so fresh and delicious. We have used chicken or tuna as a substitute for the shrimp. Always a satisfying dish! Hope you’re doing well, Shanna! I love quick and easy and this looks and sounds wonderful! It really is wonderful, Debbie. 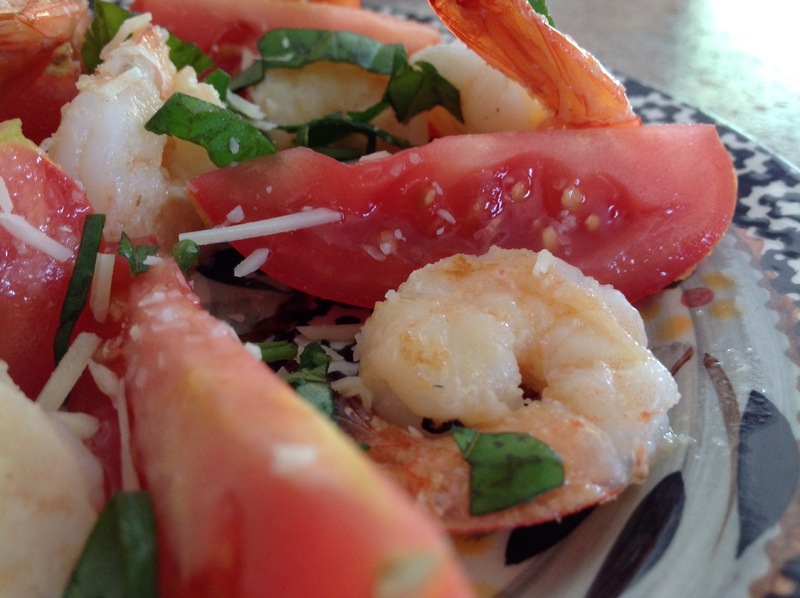 The combination of tomatoes, fresh basil and garlic make this dish so yummy!